PAW Patrol Gifts: 26 PAWsome gift ideas for preschoolers! One of my favorite ways to figure out the perfect gift for preschoolers – or anyone for that matter – is to zero in on a favorite character and buy basically anything licensed with that show. I put together this list of Paw Patrol gifts because that is M’s current obsession. Disclosure: this post contains affiliate links. Some items were received free of charge from brands for gift guide consideration. 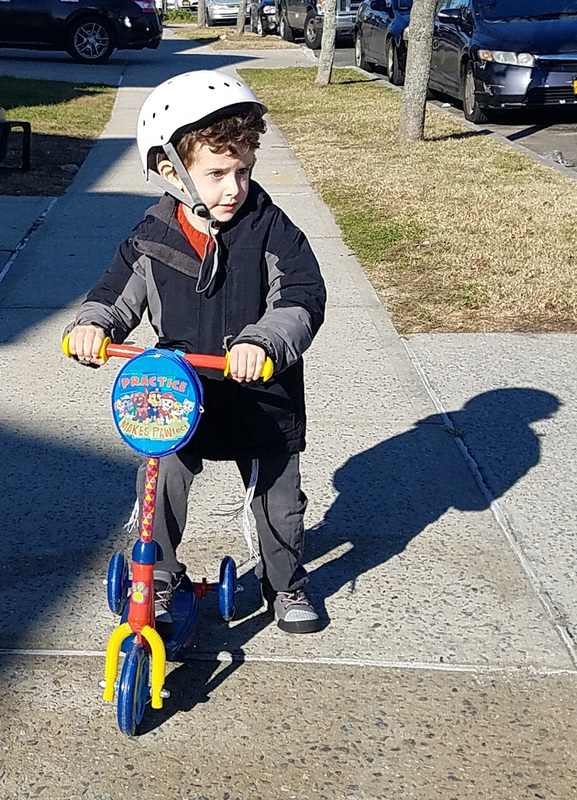 This three wheel scooter by Play Wheels is the perfect entry-level trike scooter for your preschooler! In the words of M (age four): “It even has a knapsack on it!” He was obviously referring to the accessory pouch on the front that says on it “Practice makes PAWfect”. 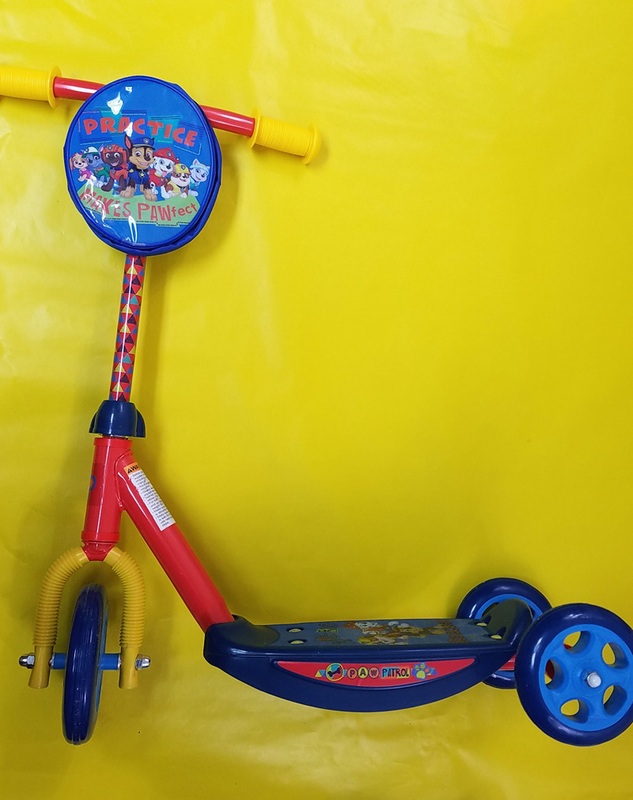 The frame is made of sturdy steel, and the wheels are large and manageable for the novice. 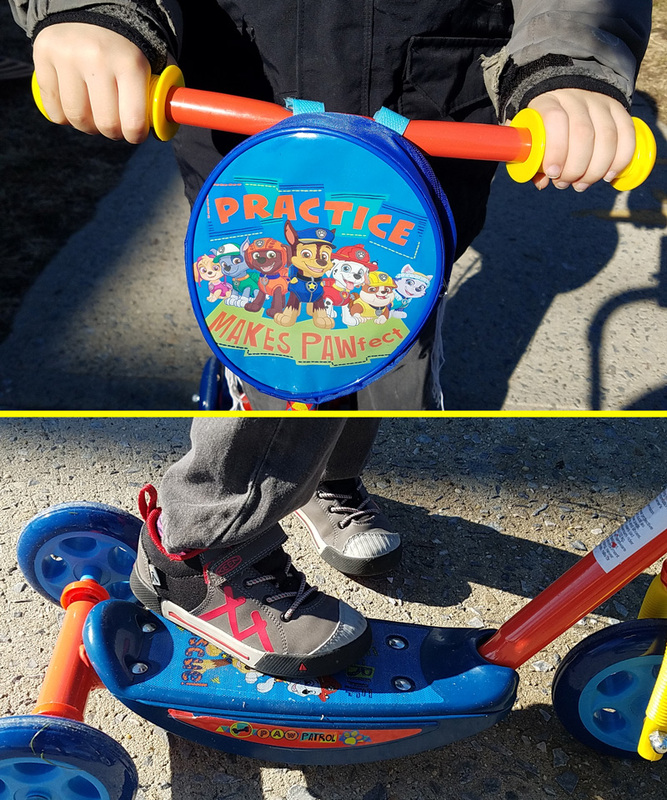 The Play Wheels Paw Patrol 3-wheel scooter is one of my favorite Paw Patrol gifts for preschoolers. 2. The Paw Patrol Lookout Tower that has everyone raving: This kid-sized tower is one of the hottest Paw Patrol gifts this year and is full of pretend play opportunities. 3. Figurines for more hours of “Let’s play Paw Patrol”! : One thing I noticed with M and his Paw-Patrol obsessed friends is that it’s a THING to “play Paw Patrol”. Upgrade it with these cute figurines. 4. The V-Tech Treat Time Marshall is the perfect “electronic toy” pick because it’s educational too! There is a never-ending selection of electronic Paw Patrol gifts but this one wins because it also teaches phonics, among other things. 5. A more hands-on way to play Paw Patrol: This Dress Up set has enough for friends too, is easy for kids to put on on their own, and is sure to provide many hours of pretend play! 6. This epic Paw Patrol play table features everything a little Paw Patrol fan can dream of – so if you’re looking to go bit, this is it! 7. A classic skill-building toy that’s bound to be a hit: Get a set of wooden puzzles with their favorite characters. 8. Turn the playroom into Paw Patrol playland with this cool play rug. Kids will spend hours playing on any rug that has roads and paths of some sort. I love that it has the Paw Patrol lookout tower emblazoned on it for more excitement! I gave M a pack of Paw Patrol underwear and he was in seventh heaven. While I won’t necessarily recommend giving underwear as a gift, there are many other practical things that wouldn’t necessarily be welcomed by a kid as a fun, exciting present, but if it has Marshall on it… it’s the best thing ever! 9. 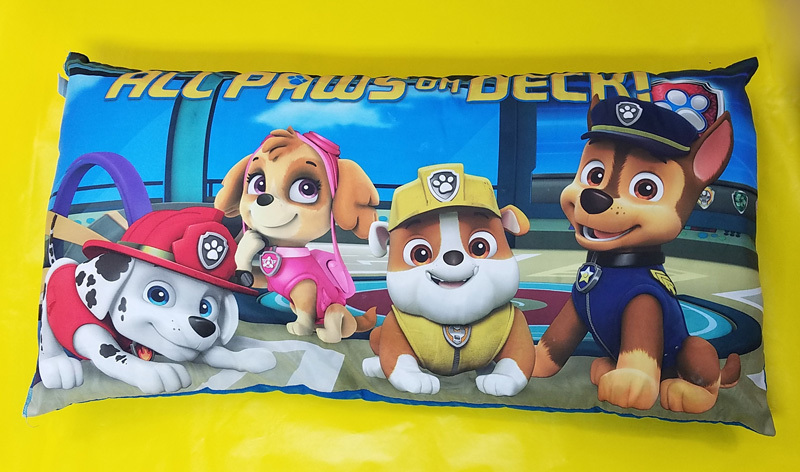 The gift of PAWsome dreams: M loves the PAW Patrol body pillow and bedding set he was gifted. Give one or give them as a set. 10. Gift some Bedroom furniture such as: Kids sleeper sofa Table and chairs Kids desk with storage Toy Organizer An entire bedroom filled with Paw Patrol furniture is like a dream come true! 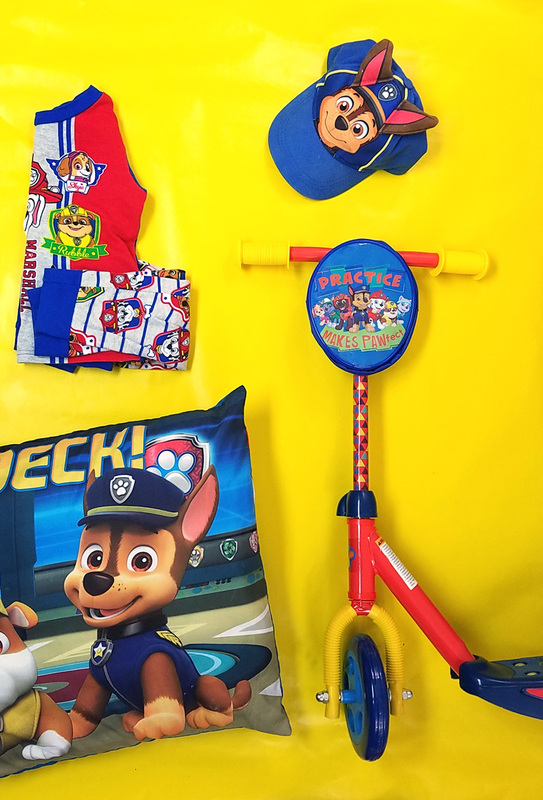 Even one piece for their bedroom will get a Paw Patrol obsessed child seeing stars! 11. Clothing, clothing clothing – and accessories – that has to be the most practical gift ever, and kids love it too! 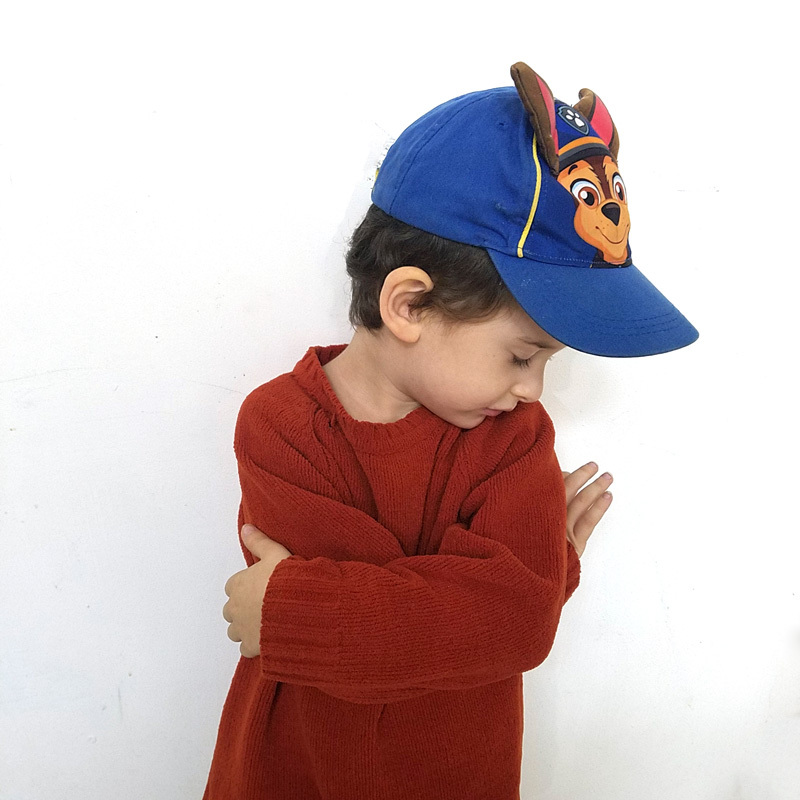 M is obsessed with his Chase cap, which is available in a winter hat version too. Or go for some light-up sneakers,t-shirts, or a cozy and cute hoodie. 12. A cool Marshall watch makes the perfect gift for any young child learning the concept of time. Gifting a watch teaches responsibility; a Paw Patrol watch just makes it so much better! 13. School gear such as Thermos Lunch bag Backpack: There’s a certain pride a kid has when walking around with his favorite character all over his school stuff. Give one of these or all to make a certain little someone very happy! 14. Hooded blanket – It doesn’t get cozier than this! A kid can never have enough cozy blankets, and this is sure to be one he’ll use. 15. An insanely cute pajama set – M was gifted a set of PJ’s for his birthday, and he loves it! He gets upset when I wash it… and gets into pajamas so nicely when it’s available for him. 16. Volume-limited headphones: With kids watching so much these days on personal devices, headphones seem like a great idea so that Mom and Dad don’t have to listen to the same movie on repeat for the billionth time. But headphones can be dangerous for delicate ears. Volume limited headphones are a great gift idea- everyone will love them! 17. Banish the scary night time with a projecting night light: It projects images of all the Paw Patrol characters onto the ceiling, plus it has a handy dusk/dawn sensor. 18. Oral hygiene set with electric toothbrush! Yes, you can give a toothbrush as a gift! Brushing your teeth doesn’t seem too bad when you get to see Marshall twice a day. There’s nothing like a good book – or some entertainment that’ll let Mom get her me-time in! These favorite picks were chosen because they’re totally PAWsome! 19. All Star Pups – It’s not all about watching Paw Patrol on screens. Bring Marshall and the rest of the gang to bedtime with this fun book! 20. The coloring kit that makes no mess: Kids love to color. You can’t go wrong with a new coloring book and markers, especially when they’ve got Paw Patrol characters – and bonus points: it only writes on the included paper! 21. Paw Patrol I’m Ready to Read: This is a great option for kids that can’t quite read yet. Keep them busy with this fun book that has animated voices that children can trigger themselves just by pushing a button. 22. Phonics box set: And for kids that ARE learning how to read, this comprehensive box set makes phonics more fun! 23. The gift of epic PAW Patrol bathtimes: I’m always in search of new and exciting bath toys. Kids will definitely be willing to withstand bath time when they get their sights on this paint set! 24. Read and Play gift box: The more books the merrier! Reading should be fun for kids, and it doesn’t get more fun when you’ve got more than twelve books revolving around your favorite characters. 25. Art desk/coloring kit: Let their creativity go wild! This coloring kit features scenes and characters exclusively from Paw Patrol and the crayons are included. 26. Look and find: This is a fun one for siblings to enjoy together. It’s the perfect entertainment to bring along when there’ll be plenty of waiting or a long car ride. 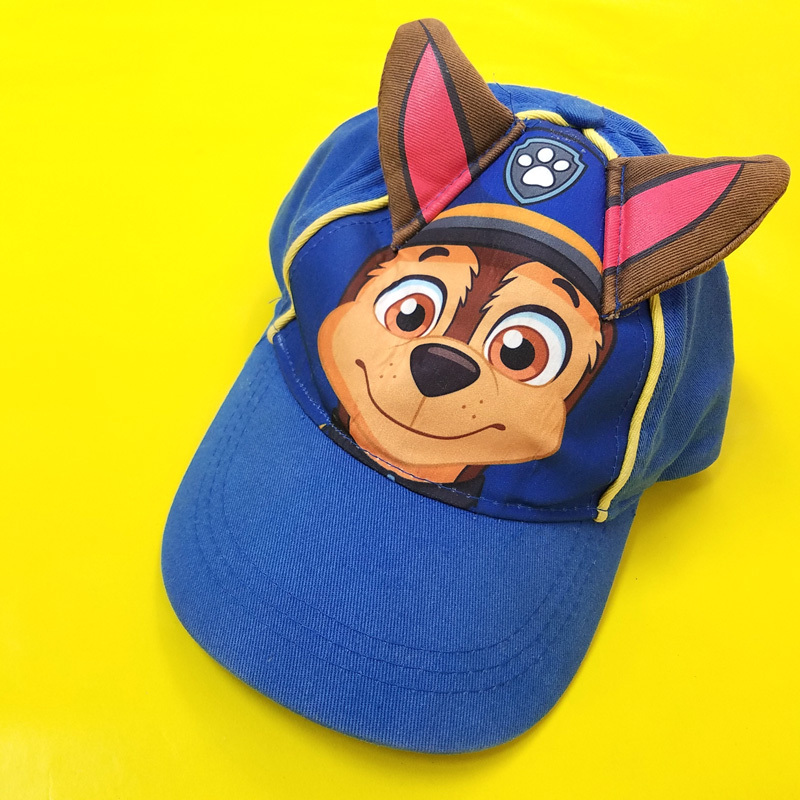 Got any favorite Paw Patrol gifts to recommend? Comment below! Gift Ideas, Mom life, Mom talk, Preschoolers. Bookmark. A Zillion Things to Make at Home!